Hello everyone! It's finally Friday... I am back with a couple of cards for the Anni-VERVE-sary sketch challenge. I used sketch AVS2010B for both of my cards. This was a sad week for our family as my mom lost her oldest sister. Farewell, Auntie Fran.. may you rest in peace... I didn't have any sympathy cards on hand, so I decided to whip a couple of them up. I used Verve's Forever in Our Hearts on both of these cards. I used papers from the Kaisercraft Lush collection once again. 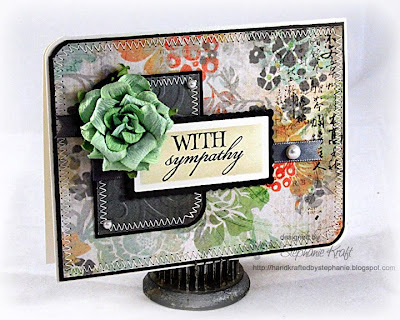 These colors may not be typical "sympathy" card colors, but I liked the soothing floral patterns. The cards are simple sentiment cards. I finished them off with some pearls, a Prima flower and some stitching. The sentiments are cut using a Spellbinders Long Rectangle Nestabilities die. 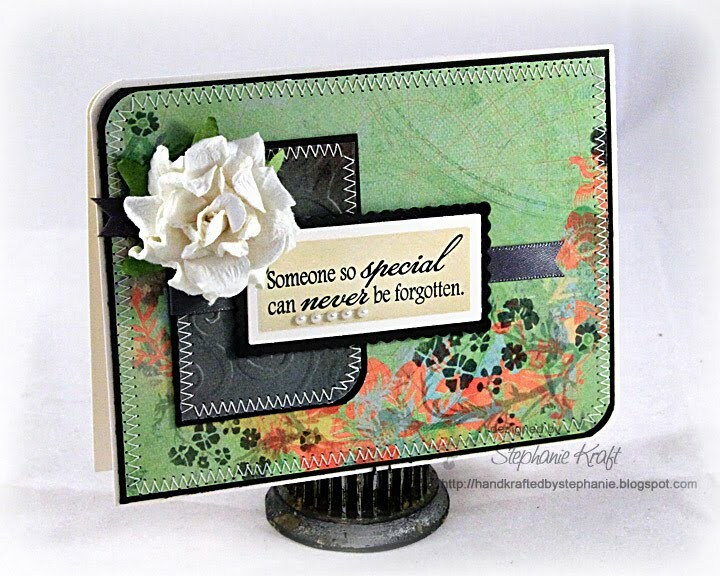 I sponged the center with Versamagic Wheat before removing the cardstock from the die, then I stamped the sentiment. Thanks so much for stopping by! I hope you have a wonderful weekend. Accessories: Long Rectange and Scalloped Long Rectangle Nestabilities (Spellbinders), D'vine Swirl embossing folder (Provo Craft), Round-It-All (Zutter), Flowers (Prima), Pearls (Zva Creative and Prima), Silk ribbon, Foam tape, Thread, Sewing machine. I have get this lovely DP.You rocked this sketch! Beautiful cards. Love the rich papers and the stitching. Beautiful, Stephanie! 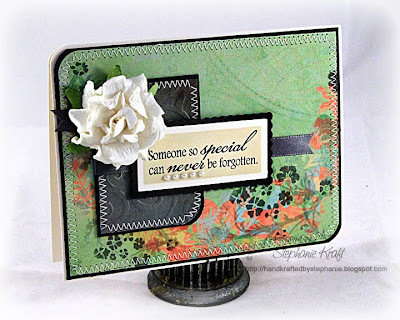 Such a gorgeous use of those papers! BEAUTIFUL!! Love the elegant papers and those awesome flowers! Such a lovely card. Your family will love them.